Printing has gone far beyond putting ink on paper. 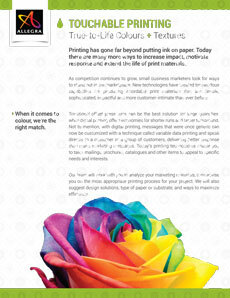 Today there are many ways to produce print, increase impact, motivate response and extend the life of print materials. As competition continues to grow, small business marketers look for ways to stand out in the marketplace. New technologies have created tremendous capabilities for producing affordable print materials that are more flexible, sophisticated, impactful and customer-intimate than ever before. Traditional offset print runs can be the best solution for large quantities, while short-run digital printing offers one-to-one marketing capabilities and faster turnaround. One-to-one marketing enables messages that were once generic to be customized with a technique called variable data printing and speak directly to a customer or a group of customers, delivering better response than mass marketing messages. Printing technologies enable you to tailor mailings, brochures, catalogues and other items to appeal to specific needs and interests. Our team will analyze your creative and printing needs, then advise you on the most appropriate printing process for your project, specifically tailored to your budget. We will also suggest design solutions, type of paper or substrate, and ways to maximize efficiency. Shop now! Don’t sacrifice the quality of your project when less is more – contact us for Digital Printing services today. Shop now! Send us a PLT, .PDF, .EPS, . TIF, or .JPG files and let us go to work. To download the Forms and Cheques brochure in pdf format, please click on the brochure image. We are conveniently located near Downtown Hamilton with easy access from highways and major city streets. Sign-up for news about exclusive promotions, product and service launches, and more! 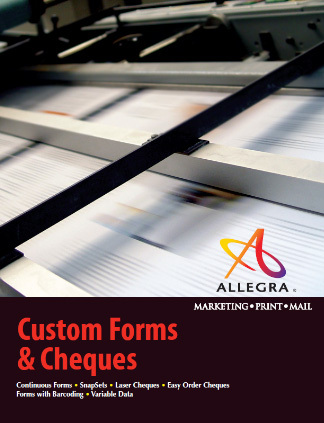 © Copyright 2014-2017 Allegra Print Marketing Mail. All Rights Reserved.